When you work out in a group and people expect you to be there, it’s a little harder to skip. Plus if you develop friendships among your workout group, you’ll be skipping more than just a workout but also missing out on a good time with your buddies. So do what you can to intermingle with a group and develop some solid connections. If you surround yourself with others who have accomplished a goal, you’ll start to ask yourself “If they can do it, maybe I can do it too!” That’s how inspiration works! They are proof and evidence that if there is a will, there is a way. They can show you that there is a path to success! Working out by yourself is typically not as fun as working out with others. Since most people think of exercise as a chore, whatever you can do to increase the enjoyment of the process, will help with your adherence to your workouts! You’ll notice when you work out with a buddy or a group, you will challenge and push each other a little harder when compared to working out on your own. This can increase workout intensity and provide the formula for great results. If you’re working out with people who are more experienced than you are, they can provide workout and nutrition tips that can assure you experience results much more quickly than trying to figure it all out on your own! When you work out in a group, if you are struggling with your workouts or anything in your life, the chances are that someone in your group has experienced those same issues and can provide some advice and insight. Sometimes you just need someone to lean on and a workout group can provide that type of support. Your workout buddies will know exactly what to say when you placed in a race, ran your best pace or lifted a personal best. They will be the first ones to congratulate you and suggest a celebratory happy hour! When you surround yourself with a tribe of go-getters, once you accomplish a goal, they will already be talking about what’s next. Maybe you trained for a 5K together, and then someone challenges the group to a 10K, then a Half Marathon and soon you’re trying a Triathlon or an Adventure Race together! Find people who dream big and help create life memories that you will never forget! You Are Who You Hang With! So if you want to be strong, fit & healthy, feel great, and live your best life, surround yourself with others who are already doing that and they can become your tribe, inspiring and building you to heights that you could have never experienced on your own. It could be a Running group, CrossFit, a Triathlon training group, a Hiking Club, an early morning cycling group, a Bootcamp or a Barre class that you really connect with that takes on the role of your Workout Tribe! For those of you veteran, die-hard exercisers…. Choose one person in your life – a friend, a parent, a sibling, a partner, a child, a co-worker, anyone who has expressed a desire to get fit – and take them under your wings and help them to get fit. You can share with them some of the obstacles you’ve overcome. You could introduce them to new, fun and exciting activities. You could schedule one or more workouts every week with them for the first 3 months until they slowly develop some independence and can start to wean away from you. You can share healthy recipes. You could register for a program or clinic together. Maybe you could both sign up for something neither of you have ever tried before – that will remind you what it’s like to be a beginner again! You could sign each other up to compete in a fun run or walk together. You could both consult with a personal trainer and do partner training at a reduced rate for each of you. There are so many ways you can help out! Many of us have business mentors; well, why not be a fitness mentor?! You’ll feel so good that you’re contributing and making a difference to someone’s life. If you can get your prodigy to the point where they’re hooked on exercise for life, they’ll be forever grateful! The Hagg Lake course offers a true test of the sport of triathlon with its rolling hills on both the bike and run leg portions of the event. 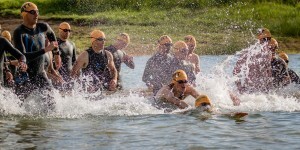 Make the Hagg Lake Triathlon & Multi-Sport Weekend one of your summer stops and compete on the course that has seen many of the greats in the sport of triathlon.